Both cylinders are attached to the chassis with temporary bolts. All the bolt holes now have to be reamed and fitted bolts made, another scenario similar to the riveting whereby there is a lot of work going on with little visual progress to the casual observer. At Buckfastleigh the crank pins are now fitted to the driving wheels with just the balancing outstanding. The pony truck wheels will probably be joining them in the near future once the various quality tests at the foundry are completed. 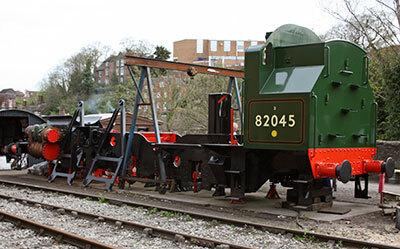 The order has been placed for casting the top frame for the rear pony truck at the same foundry near Sheffield that recently did the same job for the Standard class 2 project at the Bluebell Railway. The swing links that form part of the suspension arrangement for this pony truck are also on order. 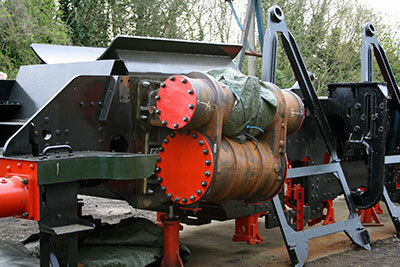 At Bridgnorth the axlebox work continues as does the fabrication of the ashpan. An article and the text for a full-page advertisement in the GWS house magazine Great Western Echo has been prepared for sending to editor Adrian Knowles for approval, after preliminary discussions with him. If the article is approved, it will appear in the late summer. Basis for doing this is the fact that the 82XXX prairie tanks were a product of Swindon and perhaps the nearest thing to a GWR locomotive never to have worn a copper cap - just a lot more comfortable than their predecessors! It will be interesting to see how the Western diehards respond to this one, but the cost of a full-page ad, at £150, means that we won't need many responses to show a profit. 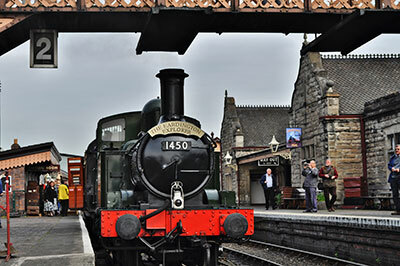 Elsewhere, we continue to receive excellent coverage from the hobby press, notably from Steam Railway, whose staff writer Clive Wheeler contacts us every month for updates. Thanks Clive: we appreciate your regular interest very much. As 82045 starts to look more and more like a loco, we think that interest in the project, already sizzling, will continue to rise. 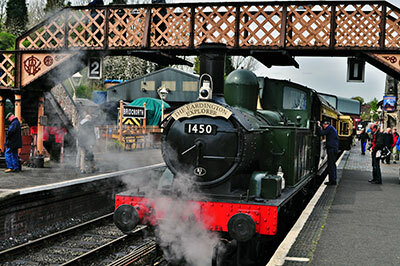 We received a wonderful publicity boost on Friday 17th April in the shape of our first special train, The Eardington Explorer (see below for more details). This continues to amaze us with its success: before the AGM, a London member told Chris that he wanted to sponsor the pattern and casting of both the superheater header and the chimney. As is often the case, the gentleman concerned wishes to remain anonymous, but we'd like to thank him very much for this most generous offer. Items will continue to be offered for sponsorship on an individual basis. On offer at the moment is the blower/ejector ring, which sits in the smokebox and is responsible for the operation of these two vital items. The blower sends high-pressure steam jets up aloft toward the chimney, thereby displacing air and fumes in the smokebox and creating a vacuum which has the effect of a strong pull on the fire for raising steam and also to counter the possibility of blowback when the engine passes under an overhead structure (bridge or tunnel) which hampers the normal emission of exhaust from the chimney. The ejector's principal use is to expel air from the vacuum pipes of loco and train and thereby blow off the brakes, the default status of which is "on". If anyone is interested in sponsoring this important bit of kit, please do get in touch with Chris. We have received a quote for the pattern which is a whisker under £3,000. Casting and machining should work out at somewhat less than this, and £5,000 should see the job done. Offers for either the pattern or the casting/machining - or for both - will be gratefully received. This stood at just under £175,000 on 23rd April, with further funds due to be paid in which will bring it close to £180,000 by the month end. Again, we are astounded at the way this has succeeded in a fraction over twelve months, and the second tentative target of £200,000 by the end of 2015 looks set to be exceeded by a considerable amount. 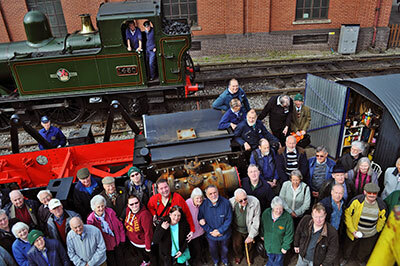 Thanks so much to all of you who have supported this appeal so generously: we already have the resources to make very considerable inroads into the building of the boiler and firebox, and look forward to the start of construction in the next few weeks. Onwards and upwards, as that chap from Gardeners' Question Time on Radio 4 is so fond of saying! 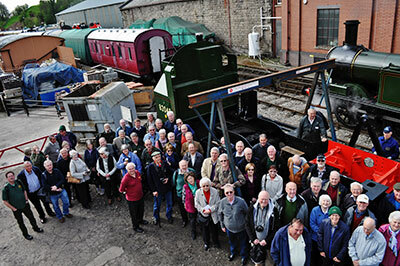 There was an excellent turn-out for the Annual General Meeting on 11th April, despite the unplanned clash with Members' and Shareholders' Weekend. 67 people attended (including those at the front) making for a lively and pleasant afternoon, with Chris in the chair and plenty of questions from the floor. Easter is early next year (Easter Sunday falls on 27th March), and we will try to fix a date for 2016 with Kidderminster Railway Museum in the next few weeks, this time hopefully avoiding clashes with SVR events. Look out for further information - it seems an awfully long way away just now, but knowing how tempus fugits it will be upon us again before we know where we are. 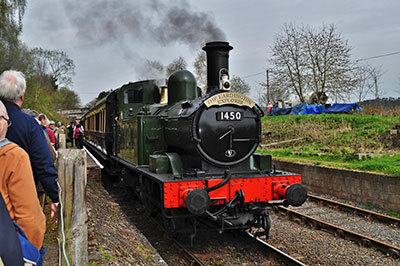 Our first special train ran on Friday 17th April. Objective was to provide participants with a different sort of SVR experience and to raise money for 82045's boiler appeal. I'm delighted to say that it succeeded on both fronts: the train was a sell-out almost as soon as it was advertised, I don't think I've ever seen so many happy faces in one go, and it looks as though it will have raised over £5,000 for the appeal. Formation consisted of three GWR Toplight coaches dating from the Edwardian/late Victorian era, headed by Collett 0-4-2 tank 1450 - it looks like a Victorian engine despite its 1930's pedigree - which proved a most attractive combination for passengers and photographers alike. It was an easy, relaxed day for all concerned (including the loco crew) and notable for its highlighting of the generally overlooked but lovely little station at Eardington. Very many thanks to Steve Downs - looking very smart in his GWR Station Master's uniform, the first time I've seen him not in jeans and a T-shirt! - and his gang for pulling out all the stops to help make the day a great success. In addition to its publicity value for 82045, we also hope that the special will have helped swell the Eardington coffers so that Steve can achieve his ambition of reinstating the single platform to its original length. Loco owner Mike Little was on the train with colleague Reg. Both said how much they had enjoyed the day and appreciated hearing Mike's little engine get to grips with Eardington Bank (please see You Tube video for a nice shot of the train climbing towards the summit). Regular working party member Bryan Clarke originated the idea of running the special, and recruited a little group consisting of Steve Downs, John Gupwell and Gareth Price to get it under way. Very well done all round, gents, and many thanks for organising a grand day out. I should also mention the splendid GWR-style headboard. The board itself was made by the Eardington Station team, and expertly signwritten at Kidderminster Carriage Works. Further specials with a difference are under consideration by Bryan and his team, and we have arranged a meeting in May to discuss what we might do next... so watch this space! Rear three quarter view of the chassis showing bunker and left-hand cylinder in place. Photo: Tony Massau. The LH cylinder in position on the chassis. Photo: Tony Massau. Some of the Eardington Explorer passengers gather around 82045's frames. Photo: Ivan Whitehouse. 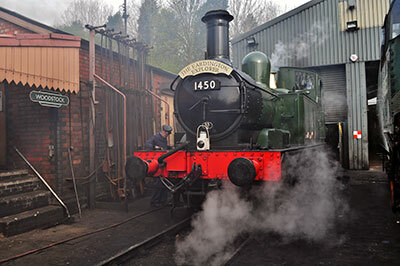 1450 being prepared for its days duty - back on the Woodstock branch! Photo: Ivan Whitehouse. Ready for the 11.00 Bridgnorth departure. Photo: Ivan Whitehouse. The EE arrives at Eardington Station. Photo: Ivan Whitehouse. Back at Bridgnorth for the 14.30 departure. Photo: Ivan Whitehouse. 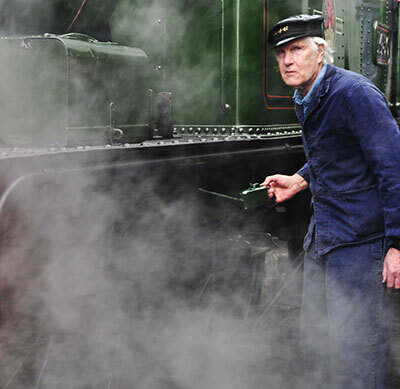 SVR Driver and 82045 project engineer Tony Massau caught by surprise while oiling up 1450. A nice video compilation of The Eardington Explorer by 'Parsound'.